It's been awhile since I've written about food so I thought it'd be a nice change up from the beauty/lifestyle posts that I've been putting up as of late! So my aunt being this huge ramen fan she is found that there is a ramen store that is Michelin-Starred! 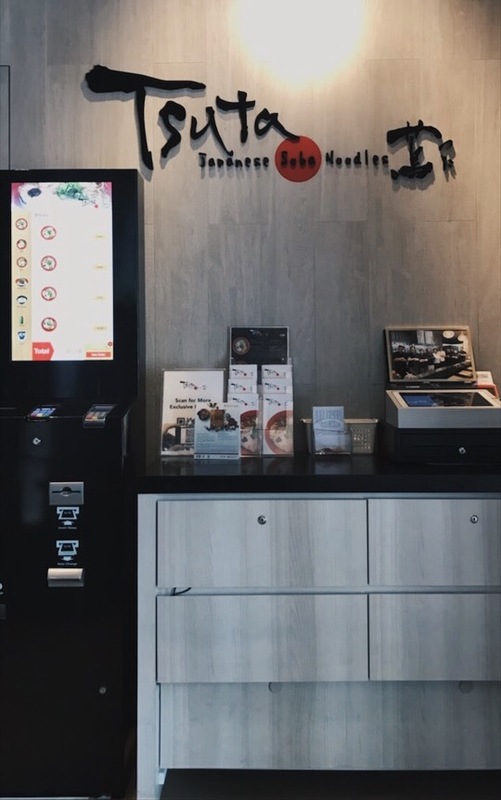 Apparently Tsuta Ramen is the first ramen store to earn a michelin star which is pretty cool I'd say. Apparently they are known to have long queues so much so that they prepared queue lines/seats! We were lucky enough to reach at a time where there was no queue at all and the place was pretty quiet. So I highly recommend you to go about 3pm on a weekday to save yourself from queuing! The cool thing about this place is that you make your order on this giant screen and pay there and then so you can get it out of the way and just enjoy your meal! Personally I feel that this meal is pretty affordable, like any ramen store you'd find outside and for the portion, it is really worth it. The store seats only 18 people which probably explains the reason that a queue may build up but it's quite a cosy setting! Here's how the menu looks like minus the drinks and the sides. The sides options are pretty small if you'd ask me but since the ramen is the star of the show , it doesn't really matter! All the seats are forward facing towards the counter where the chefs prepare all the food which was quite a delight imo. For sides we had firstly was the Ro-su Meshi - I can only describe this as the softest pork I've ever had in my life. I literally cannot stop thinking about it?! The best way to tell you its texture is to think of it as a really well smoked salmon. It doesn't exactly melt in your mouth but unnnnfff it was so good. And the sauce? I have NO idea what it is made of but my guess is truffle butter? It's so rich and just everything I love! Not going to lie, this was probably my favourite dish, I liked this even more than the ramen itself! Secondly was this Aburi Niku - pork shoulder cubes which are SO tender and packed with so many layers of flavours! They charred the meat with a blowtorch in front of us and it was pretty cool even though the charred smell can get quite strong. My aunt got the Char Siu Miso Soba which is essentially a thicker broth with four slices of pork (you can order without, with one slice or four slices) and other toppings like the corn and bean sprouts. It is very, very flavourful and you'll probably love it if you enjoy food that are jammed packed with flavours that gives you a good punch with every bite. I went for the Char Siu Shoyu Soba which is the lighest broth of the three available, with four slices of meat but without the egg. I've gone to prefer my ramen without the egg because it ALWAYS gets me too full. The reason this ramen has such strong flavours apart from the broth is much thanks to the truffle. If you're a truffle lover, the ramen will be such a treat for your tastebuds! It's not overwhelming but with every sip of the soup you could really taste the truffle, I thought that it really complimented the richness of the dish! The noodles as you can see are the thin type, and it was cooked pretty well, leaving it pretty firm and chewy still. My least favourite part of the noodles were the bamboo shoots mainly because I hate the smell of it but this was the few times I've seen fresh(?) bamboo shoots served on ramen. The meat was not the softest, it has quite a bit of a bite to it but because it is so thin, it makes it less taxing to chew on them. What I observed from sitting in front of the chef, its that every ingredient is meticulously taken care of - its like a ramen apple store? Where one ingredient is put on by one chef and they take turns to do it which is pretty interesting! Overall the experience was pretty good, I'd give it a 3.8 out of 5 stars. Not a full 5 because it's not the best ramen I've ever had in my life despite it being a Michelin-Starred ramen restaurant. The broth to me was saltier than I would have personally preferred but the Ro-su Meshi tho... HOWEVER I think it's a great experience to have and I really enjoyed the truffle taste in the soup just because I love truffle! If you love your ramen, I'd recommend it to you but try not to go with too high hopes thinking that it's gonna just give you mouthgasm or send your brains to ramenland, it's good but its not great. Oh and yes, the wheat tea is refillable so don't forget to get your seconds! I hope that you enjoyed this post and it's given you a little idea on where you can get your next ramen fix! You can find the ramen stores at Pacific Plaza and 18 Tai Seng.